As you enter the front door you have a sejour that leads you to a spacious and well equipped kitchen with large semicircular window. There is one double bedroom and another double with twin beds (that can be combined). Rooms have beutiful panoramic windows over the Vallombrosa valley and florentines hills. 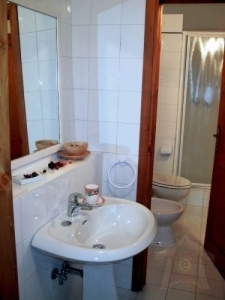 Then, a large bathroom with shower. 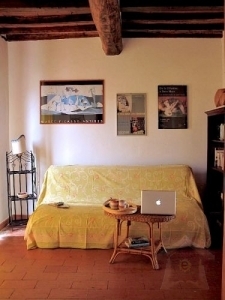 The apartment hase been recently restored, there are terracotta floors and beamed ceilings. Outside a tiled private terrace with beutiful views over the Arno valley, with table, chairs, deckchairs and outdoor furnitures. 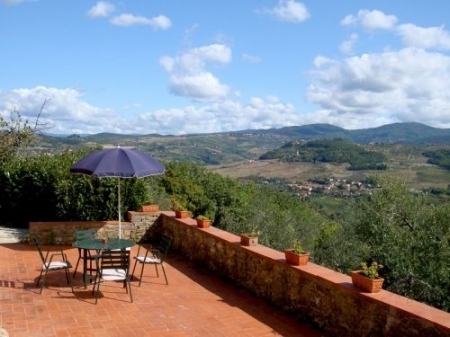 La Favilletta is a lovely Tuscany Farmhouse built in mellow stone. It was a reclusive monastery during the 18th century, then a farm estate. In recent years it has been completely restored in typical tuscany rustic style, with terracotta floors, antique furnitures and beamed ceilings throughout. In our apartment you can use internet with a free wifi connection, a shared barbecue is placed in the garden and a loundry area with washing machine are also available. We have 4 bikes and during the summer season, we have a smal vegetable garden with salads, tomatoes and many other products. It represents an ideal base from wich to explore Tuscany towns and their treasures (only 20 km far from Florence) and also for spending some relaxing days taking some walks in the paths near the apartments, discovering Tuscany villas, ancient churches in the close old road of Chianti Rufina and Pomino wines with many cellars where you can taste the typical local red wine.